If you have a termite problem in San Tan Valley Arizona, you may want to find out what kinds of termites you are dealing with. Knowing which kinds you are combating can really help when trying to determine the treatment you want to implement to get rid of them. Doing your research is a great way to get all the information you need for future termite problems. You can even avoid termite problems if you try to understand which types you come into contact with and how best to treat them in the future. Here are some ways to identify which species of subterranean termites are invading your home. Termites can be found everywhere in the United States, with the exception of Alaska. Unfortunately, this is San Tan Valley, and they are extremely common. The subterranean termites live primarily in the soil beneath and around our homes, but they can be extremely destructive when they enter it and feast on the wood of our homes. Sometimes they can be hard to identify, as they conduct their chaos in the siding of our houses and inside of our walls. The best way to tell if subterranean termites are feasting on your home are the mud tubes they leave behind and Swarmers, which are reproductive termites. Knowing what kinds of termites you’re dealing with can help you get rid of them. There are plenty of different species of subterranean termites, and the most common one is the winged subterranean termite, also called swarmers. As mentioned in their name, they have wings. And then also come in a variety of colors ranging from black, to light brown. In San Tan Valley, they look more black than anything and they can look extremely similar to flying black ants. The appearance can sometimes cause confusion. You can tell the difference between the two by observing them closely. The winged termite has four, equal length clear wings that are symmetrical. The black ant, however, has four wings, two of which are long and the other two much shorter. In addition to this, termites have two straight antennae, while the winged ant’s antennae bend toward each other. The most notable difference between the two is that the termite only has two body segments. The ant has three that can also be mixed with red and black coloring. Knowing the difference between the two can save you tons of money when trying to dictate the proper treatment of your bug infestation. If you do have termites, you should pray that you don’t have worker termites. Worker termites do the most damage and make up the majority of the subterranean colony. These are the termites that are most likely to be found in homes, devouring wood and causing destruction. This particular kind of termite is a light cream color and lacks the wings that the winged termite has. Closely related to this termite are the soldier subterranean termites. They are identical to the worker termites apart from their much larger brown heads and the pincer type jaws. These are matured versions of the worker termites. A good way to tell if the colony of termites infesting your home has matured is to identify the amount of swarmers. Maturity happens two to four years after the colony starts its destruction on your home. Active during the daytime, most termites do the most damage between January and April. When inhabiting a home, worker termites will usually build muddy, tube-like structures outside of the walls and other areas they are inhabiting. These are called shelter tubes and they are designed to protect the termites when they are outside of the wall. These tubes are brown and made of dirt, termite saliva, and feces from the termites. These tubes allow the termites to move in large numbers from the inside of the wall which is their food source, and to their outdoor colony. The tubes can also be found on the outside of the wood structures that they are infesting, and are great identifiers of subterranean termites. Thanks to their easy dehydration, termites can be found near water sources and windowsills. So check these areas first if you suspect that you have a termite infestation. 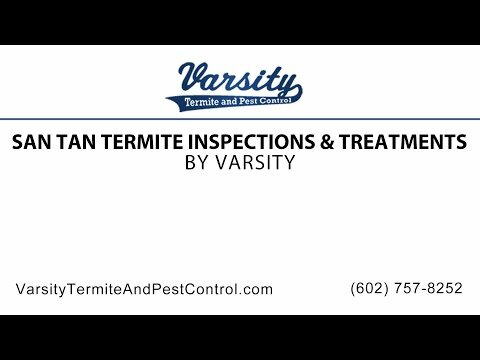 If you need a quality San Tan Valley termite control and termite treatment service, look no further than Varsity Termite and Pest Control, where we can help you identify the termites you are dealing with, and eliminate their presence in your home. For more information about termite control and treatments, contact us today.